Tennis shoes are designed with extra lateral support to endure the rigors of the game's frequent lateral movements and quick stops and starts. Finding the right shoe can be difficult given the wide selection available. One should consider the style of tennis that you play, the type of court that you usually use and what your foot type is before you make your final shoe selection. Many people want to wear their regular running shoes to play tennis, but there are many good reasons that athletes should wear proper tennis shoes. Running shoes are specially designed for the forward motion that comes of running or walking for fitness. They have thick, soft heels that increase the cushioning and lessen the impact that comes with running. However, runners do not turn quickly or make rapid lateral movements so the shoes are not built to support player's feet during a tennis game or practice. Tennis shoes provide stability for side-to-side movement, built of heavier and stiffer materials than other athletic shoes, their flat, durable soles are designed to prevent stumbling or sliding and the toes are reinforced for stop and go action. So which one are you? A great way to learn about your feet is to check the wear on your shoes. Take a look at a pair of shoes you wear frequently and see which areas of sustained the must wear over time. If your shoes show a lot of wear on the inside of the sole and around the ball of your foot then you have a Pronated foot. - The Pronated foot is the type most commonly associated with injury. 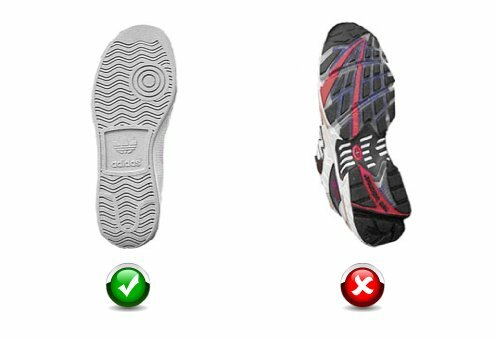 You should be extra careful about the shoes that you select and choose a tennis shoe with lots of support and cushioning. - If your shoe shows a lot of wear along the outside of the heel then you have a Supinated foot. Players with a Supinated foot tend to wear shoes out faster than other players. In such a case an extra durable sole would be the best choice. If when you look at your shoes it seems that there is even wear all around then you are one of the rare Ideal types. - Players with Ideal foot types have the flexibility to choose any kind of shoe as long as it is comfortable, and they might want to prioritize their shoe based on the surface on which they play ( e.g., grass, concrete). So you have figured out what kind of feet you have and what kind of support levels are best, what else should you consider? Playing surface is the next key element for any player. Tennis matches can be held on concrete, grass or clay and each are very different surfaces of play. Clay courts allow a natural 'slide' as the player moves so you can have slightly lighter lateral support, but the fine grains of dirt can be bothersome to feet, so be sure that you have a solid upper of leather or synthetic material. Grass courts give players the most natural cushioning which means that you can forgo some cushioning in preference to more lateral support. Concrete is the most common playing surface and can be the most challenging for player's feet. The hard surface is unforgiving demanding as much cushioning as is comfortable. Lateral support is also key as player's stops and starts are particularly sharp on the firm concrete surface.